Referenced from a photo by Mark J Barrett. This is absolutely beautiful and I also adore your watermark. I wish I could make something like that for my art. Keep up the amazing art! The lighting on this is absolutely stunning. Wow.. that lighting is so powerful... and vivid... what life!!! My god...your art catapults me into a whole new world of emotions Your use of composition, light and subjects is perfect! Thank you very very much! I am glad you like my art! Gorgeous lighting on this, I love it! Gorgeous unicorn! 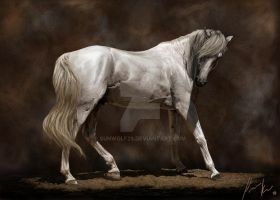 I love horses, and you definitely have skill with lighting. The curling mane is especially well done, this is a very sweet concept and I simply adore it. Your use of lighting is gorgeous! It definitely brings out the focal out of your work. It's stunning. Keep up the amazing work, please! You've done an incredible job with the whole painting! It's gorgeous!